Thanks to conservationists and outdoor enthusiasts, Boston-area hiking opportunities are vast and abundant. 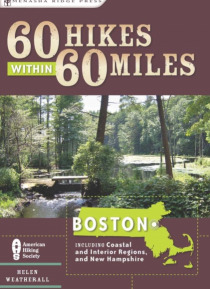 60 Hikes Within 60 Miles: Boston guides hikers on routes trodden by the likes of Wampanoag warrior King Phillip and his colonial adversaries, Concord's Henry David Thoreau, Mason Walton - the hermit of Ravenswood, and countless farmers and tradespeople who have walked this historic land sinc… e the country's founding.With helpful list of hikes in the front of the book for special interests --; best hikes for children, scenic hikes, hikes good for wildlife viewing or seeing waterfalls, best hikes with historic sites and more --; hikers of all skill levels can find their perfect hike. Expertly drawn trail maps and trail profiles complement the detailed trail descriptions and useful at-a-glance information.